Soluble coffee made from 100% pure coffee beans. Stir your senses with NESCAFÉ GOLD ORIGINS Indonesian Sumatra instant coffee. A premium medium roast instant coffee with an intense flavour. Crafted with 100% Robusta coffee beans from Sumatra, Indonesia. Smoky and aromatic, with earthy notes and hints of nuts and caramel. Grown respectfully; sustainably sourced & selected by local farmers.Delight your senses with each intense cup of NESCAFÉ GOLD ORIGINS Indonesian Sumatra. 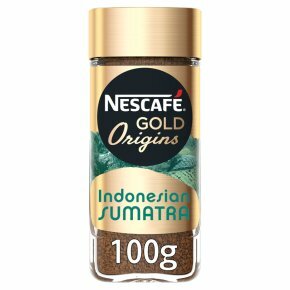 This premium single origin instant coffee borrows its uniquely smoky, aromatic flavour from 100% Robusta coffee beans handpicked in Indonesia. Savour its dark, earthy flavour with subtle notes of nuts and caramel.